Hello everyone! I have been working on a game over the last couple of weeks. It is a top down stealth game about finding your way through to the end of each level. I wanted to share a very early "playable demo" to see what people thought about the core concept and game play. The presentation is VERY rough but I think the game is still playable and fun. I am planning on adding a scoring system with secondary objectives, better guard AI, an actual menu, and obviously more levels. Below is a link to the published .zip in Google Drive. If you you have a few minutes of free time to play I would love to hear what you think, feature suggestions or bugs reports. The game is all in English but if you managed to read through this post that probably won't be a problem for you. That was fun Nothing much to look at, but you've got the gameplay groundwork going, would have played more levels if there were. 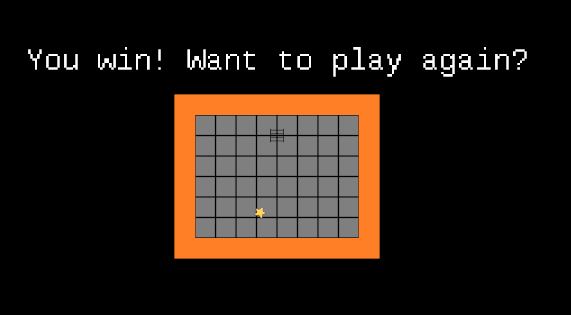 Only thing I found a bit annoying is the controls, specifically the necessity to press E and hover the mouse over the target object both to pick something up and to use it. I can get behind having to look into the right direction for using, but having the mouse cursor exactly over the object is a bit too much. Also, I don't see why I can't just walk over something to pick it up. As far as feature ideas go, I think you've got a lot of untouched potential in exploration. There are all these rooms that are just empty - give the player something to explore! More objects to interact with, maybe buttons that do something somewhere in the level, or powerups, or bonus points / stars to collect, or little notes with text on them that tell a story. Thanks Adam! I definitely want to expand the exploration element with secondary objectives. Adding more interactive elements is a good idea as well, I was not specifically planning for that but I will add it to the list. I have received criticism on the mouse interactions from another person as well so I will be changing that.